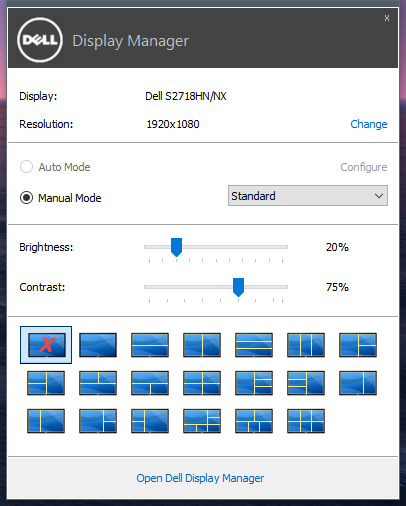 Hello, I just purchased the aforementioned monitor and after installing the latest DDM software on my Windows 10 computer, I noticed that the auto mode is grayed out, why is that? Computer runs the latest Windows 10 operating system update, using an Nvidia GTX 1060 with also the latest drivers. The display is automatically using HDMI 1.4 when anything but HDR mode and HDMI 2.0 when HDR is on. If HDR is on, auto-mode is off. I'm using the Standard profile on the monitor and HDR is off on Windows. Right. Thing is, in order to activate HDR on Windows, I have first to enable an HDR preset from the monitor otherwise there is no such option visible. I did notice from the device manager on windows, that my monitor uses HDMI 1.4 connection when no HDR profile is selected and when selected it switches to HDMI 2.0. Still not sure why DDM auto-mode is not working. Go to non-HDR, standard preset mode. Then, press/hold the shift key, right click on the DDM system tray icon, select "Save diagnostic report" from the popup menu. Post it for swamped. Here is the diagnostics txt as you asked me. I also added a screenshot to highlight the issue. Command line = "C:\Program Files (x86)\Dell\Dell Display Manager\ddm.exe"
17:41:50.289...OS monitor sleep timeout value = 0 ms. Installed the version provided by swamped, unfortunately issue still persists.